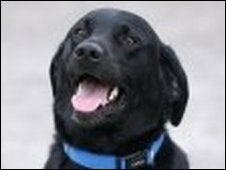 A Labrador who fought to protect its owners from a knife-wielding burglar has been honoured for his bravery. Toby was stabbed four times in the chest and legs by the intruder but still managed to chase him out. They awoke to find their pet in a pool of blood. But the eight-month-old survived and has been awarded by the animal charity, PDSA. The armed burglar, who attacked Toby with three knives taken from the kitchen, was sentenced to three-and-a-half years for the offence. Toby suffered a punctured lung in the attack, in June 2007, as he fought to stop the offender going upstairs to the sleeping family. After succeeding in chasing the offender out of the building Toby then woke his owner, Jonathan Morton, by barking. Had it not been for Toby's determined barking and lunging at the intruder, Mr Morton would not have been aware of the threat to his family. Mr Morton and his wife Samantha praised their pet's actions. He said: "Toby is our hero. I dread to think what could have happened if he had not intervened that night." The Labrador has been presented with the PDSA Certificate for Animal Bravery by the charity's senior deputy chairman Chris Heaps. He said: "Had it not been for Toby's determined barking and lunging at the intruder, Mr Morton would not have been aware of the threat to his family. "Toby is indeed a worthy recipient of the PDSA Certificate for Animal Bravery."